a creamy mayonnaise and spices. You can feel free to use any kind of meat variation (grilled chicken or another kind of kielbasa) but the concept is quite tasty as the salad is tossed in a mayonnaise. My husband really enjoy’s this salad and I certainly don’t mind making super easy and tasty recipes. Thanks to my mother in law (she currently has her own cooking blog svetasrecipes.com) who shared this recipe with me sometime ago. 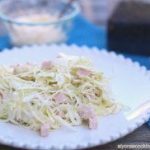 Try this cabbage salad the next time you want to make something quick yet tasty. 1.) Finely shred 2/3 of a head of cabbage (a little more than half of a medium sized cabbage) into a large bowl. 3.) Add bologna to the shredded cabbage and add remaining ingredients. 4.) Toss everything together, adding more mayo or seasonings to taste. TIP: This salad is best fresh so add the mayo right before serving. The longer the salad sits the softer the cabbage gets. Finely shred 2/3 of a head of cabbage (a little more than half of a medium sized cabbage) into a large bowl. Add bologna to the shredded cabbage and add remaining ingredients. Toss everything together, adding more mayo or seasonings to taste.